Global Helicopter Service (GHS), a German Air Operator, offers EASA-approved commercial helicopter services to industrial clients worldwide. GHS delivers essential helicopter services to companies with unique challenges and is able to cover a wide field of applications. The management team has many years of experience supporting several clients in industrial sectors, including mining and metals, and oil and gas. GHS’s pilots undergo ground simulator training on a regular basis to maintain the highest standards of performance and safety. In addition, all of the company’s staff undertake theory training sessions as relevant, to ensure best knowledge and mission readiness in their particular tasking. GHS steps in for highest levels of safety, reliability and efficiency in all their doing. A transparent and straightforward business relation to GHS clients is most important to the company, and the basis for absolute customer satisfaction. GHS is well-prepared to fulfil any helicopter passenger transport requirements, even serving the most remote areas for mining operations and offshore projects. Together with its valued partners, the company provides access to a fleet of more than 40 Bell 412 and Bell 212 helicopters, as the ideal and robust platform for challenging tasks in almost any environmental conditions. GHS pilots are highly skilled with wide-ranging experience of flying in all weather conditions and in almost any environmental scenario. Together with its EASA-certified and proven procedures, GHS guarantees the highest safety, quality and efficiency possible. Whatever your business’s passenger transportation needs are, Global Helicopter Service will accommodate you. Aeromedical evacuation is becoming increasingly important in locations such as Africa, especially considering the number of remote mining sites that are difficult to access by road. In the event of an emergency, every second counts, with helicopters guaranteeing the safest and quickest evacuation process to gain in/out access for urgent help. Safety and security policies of major companies in the oil and gas producing industry (OGP), and the desire of the governments and NGOs to provide modern and effective medical evacuation (medevac) systems in their countries, has led to the enormous growth in the demand for those services. GHS offers a wide field of options and operational concepts to perfectly match with your particular mission requirements when it comes to medical evacuation services. The mining industry requires reliable logistics services using GHS helicopters as the only means of transport to their remote locations. GHS has the capability and experience to fly any type of cargo or urgently required parts and equipment, regardless of most weather conditions. The company always matches its helicopters to actual mission requirements, ensuring that each job is performed safely and quickly and that your goods arrive at your project site in time. Having a helicopter on standby to transport urgent goods can be hugely valuable, guaranteeing the shortest possible reaction and response times in cases of technical breakdown. GHS helps to keep mine sites operational, minimising downtime and costly production losses. Furthermore, high-value goods such as gold or diamonds can be transported across the jungle or outback more reliably in a helicopter than a 4×4. GHS holds all approvals for a safe transport of dangerous goods in accordance with IATA. In many cases, a helicopter is the most fast and cost-effective way to get valuable cargo exactly where it is needed, especially in remote areas with poor infrastructure, or when there is no road access at all. Whether simple cargo transport, challenging resupply of small bush camps or complex airborne construction work, GHS helicopters are prepared to do the job and are capable of lifting loads up to 1,500kg at a time. If required, GHS can also arrange and provide solutions for load-lifting projects with payload capabilities up to 4,000kg. 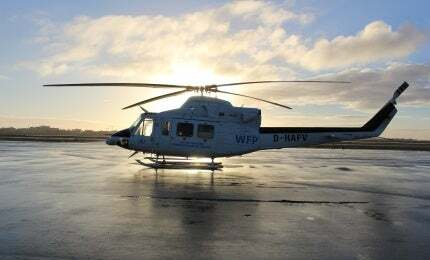 Helicopters can also be used to fulfil special requirements for seismic missions and surveillance tasks. When contracted for a sling load job, GHS supplies a full complement of experienced ground crew, including a fuel bowser allowing the helicopter to maximise its output while in operation and on-site. All lifting jobs are supervised to the highest standards, ensuring safety and proficiency at all times. GHS Staff has been actively involved in firefighting activities across Europe for more than a decade. The company’s Bell 212 and Bell 412 aircraft can either be equipped with Bambi Buckets or a ventral tank and snorkel systems, which are both proven to be highly effective during such applications. Even if this is not the primary role of the helicopter when it is commissioned, it is reassuring to know that GHS can support firefighting activities at mine sites from the air. Alternatively, the Bambi Bucket option can be employed for delivering water supplies to inaccessible areas. GHS provides helicopter transportation of company officials or key personnel, with special security precautions as required. The company’s management staff and crews are trained to handle all demands with absolute discretion and comfortable VIP seating configurations are available on request. Global Helicopter Service is proud to announce a brand new division; AS332L Super Pumas. GHS was founded by a highly motivated and experienced management team in early 2014, serving as a German air operator with a focus on providing commercial helicopter services worldwide. We strive and uphold the utmost in terms of reliability, safety, and quality, with the aim to provide our customers the best possible service, and most efficient solutions in line with their individual requirements.